The package includes both the rental of the Telecare equipment and 24 hour monitoring from our monitoring centre. 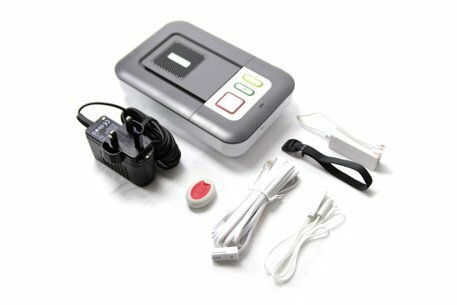 The Telecare equipment includes the plug and play base unit, the wireless waterproof pendant button and the wrist strap and necklace attachments. *If the alarm user has a long-term illness or disability they will qualify for VAT relief on eligible products. For further information on VAT Exemption please visit the HMRC website. If you or the person you are purchasing for is ill or disabled you do not have to pay VAT for the alarm service. **A Direct Debit will be set up at point of ordering to collect subsequent monthly payments. The Lifeline GSM Alarm allows you to be protected by our Telecare service, even if you don’t have a landline. Instead, the GSM Alarm uses a SIM card to connect itself to a mobile phone network. The device will search for the strongest signal from a range of providers and connect to the number one network. There’s no need to worry about the SIM card, we send all of our GSM Alarms with the SIM card already fully installed. All the alarm user needs to do is to plug the device into the mains power in their home. The alarm user can then press the red help button to complete a test call with our monitoring centre, who will ensure the SIM card is connected as it should be. There are no extra SIM card costs involved either, once you have the alarm everything (including calls) is included in the price you pay today. 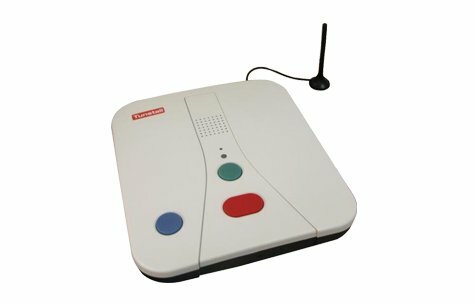 Users can call for help by pressing the large button on the Lifeline GSM Base Unit, or by pressing the red button on their pendant – which is worn around the wrist or neck. This will send an emergency call through to our 24-hour monitoring centre, and an operator will then respond over the GSM’s loudspeaker. They will assess the user’s situation before taking appropriate action; calling for family, friends or neighbours, alongside the emergency services if they’re needed.